Having endured a long, cold and wet December, many of us were looking forward to a brighter start to 2013. However, this has not been the case as we have seen many parts of the UK hit with torrential rain and more recently…..snow. In spite of this, Aerosaurus Balloons Ltd have been keeping busy by putting on a number of outdoor displays in the lead up to Christmas, attending local charity events and conducting a number of school visits to educate children (and their teachers!) about the various aspects of hot air ballooning. We were particularly excited about being asked to participate in an event celebrating a new partnership between the ‘West of England School & College’ and the ‘Princesshay Shopping Centre’, both situated in Exeter. The West of England School & College was founded in 1838 as a specialist centre for young people suffering from visual impairment. Nowadays the college is attended by more than 100 young people all year round and employs a team of more than 300 specialist staff, which as you can imagine does not come cheap. That’s why this year, to mark 175 years since the college was founded, they are teaming up with the Princesshay Shopping Centre as a charity partner to ensure the on-going success of the college. So, where does Aerosaurus Balloons fit into all of this?? Well, to celebrate the new partnership, we were invited along to the main square in Princesshay on Monday 21st January to participate in their official launch. We were asked to inflate one of our smaller hot air balloons and give six young students from the college the chance to experience a ‘lighter than air’ feeling. We also conducted several burner displays to demonstrate the awesome power they are capable of and displayed a large banner to commemorate the occasion. Fortunately we had perfect weather conditions and managed a full inflation in the middle of the shopping centre, something you don’t see every day! The event attracted a lot of attention from both the media and the public and was deemed a great success by all involved. We would like to thank the West of England School & College and Princesshay Shopping Centre for giving us the opportunity to be involved in such a memorable event. 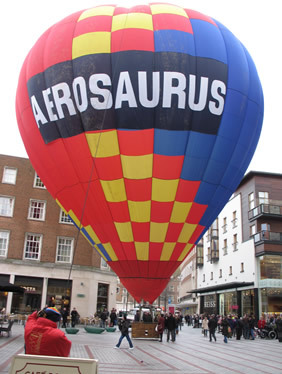 Aerosaurus Balloons Ltd are always keen to help local charities and as such, we offer reduced price hot air balloon flight vouchers which can be used as prizes for fundraising events. If you would like to apply for our discount vouchers, or require any further information, please visit our website.